So coming up on the BBQ. Sim asked if there was anything they could bring which made me think I should post something. We will have some steak and chicken and some veggies. If there is a meat you want, or a salad or anything. Feel free to bring it. I'll have some beer, but not enough for everyone to have a bunch of. Feel free to bring beer or anything else you drink including pop and juices. Jordan we could pick some up tomorrow? Bacon beer's long gone. I'll be bringing some Korean BBQ meats. Aj I'm looking forward to it. Anyone looking for an E-fan set-up built for a 740 Turbo? Or a 16T? I can bring them over for those who are curious. Kardboard was that you there at Byrne? Where did you go? It was great to meet PoptheclutchPillay to bad I had to jet. If anyone has any lines on a clean late model 240 that will be available around Sept 22 please let me know. Sold my Cummins and getting rid of the mud truck, gonna need a daily while the s13 gets built. Last edited by GabAlmighty; 08-29-2014 at 01:56 AM..
Lol it was me. I tried to look for you again on the way out but I couldn't find you? So who's all going to the OMGWTFTBBBQ tomorrow night? 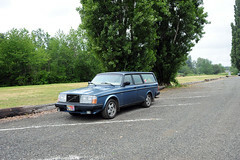 '87 Volvo 745 -The Weekend Toy. Swapped B230ft, LH2.4 FI Upgrade, M46, welded diff. '94 855 T5 - RN T5 Swap, Manual Swap, 16T Turbo, 3" Downpipe, lowered on IPD Springs. '96 855 T5M - Factory T5M Wagon. 20T, Green Giants, 3" Downpipe, H&R Springs, Billy HD's, Meth injection, ARD Tune, IPD barz. '98 S70 T5M - Old Man's Daily. Awesome! I visited the guy on Saturday. Quite a lot of stuff there, but couldn't really use any of it except a map pocket for the 240. Those poor Bertones need good homes too. Last edited by PopTheClutchPillay; 08-31-2014 at 12:57 AM.. Thanks again Jordan for inviting us! Had a sweet time meeting some really cool people with cool cars! Last edited by PopTheClutchPillay; 08-31-2014 at 12:58 AM..
Glad you all made it. Sorry I didn't get to socialize as much as I should have but the BBQ was a happening unit tonight. "Wow that's a lot of money... Wait, who put the steering wheel in wrong?" Either that, or it's the special V70 T5 mail delivery vehicle edition. Probably would be perfect for rural mail carriers. Guaranteed. And it wouldn't have cost them more than $4000 to get it into Vancouver. I don't imagine with that mileage they would have had to put much more in to pass inspection either. 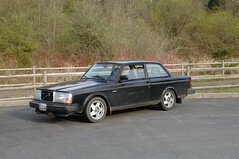 Why on gods green earth you'd import a RHD WWD volvo is beyond me. You'd be better off bringing in a RHD 240 or 940.
hell, even a super clean 850 turbo with the steering wheel on the proper side wouldn't cost that much, and it still wouldn't sell at that price! Anybody planning on going to VCBC's Cates Park Picnic?